"This appetizer is loaded with so many flavors and it's vegetarian and healthy. Give it a shot if you want to impress! It may sound like a ton of work, but it really is simple. If you like bold flavors, you will love it!" Mix roasted red pepper, shallot, garlic, 1 teaspoon olive oil, mint, lime juice, Dijon mustard, cilantro, 1/2 teaspoon salt, red pepper flakes, coriander, 1 pinch black pepper, and cayenne pepper together in a bowl to make harissa sauce. Combine cannellini beans and water in a small saucepan over medium-low heat; heat until warmed through, about 5 minutes. Drain. Combine drained beans, 2 teaspoons truffle oil, 1/2 teaspoon salt, and 1/4 teaspoon pepper in a food processor; puree until smooth. Preheat grill for medium heat and lightly oil the grate. Brush mushroom caps on both sides with 4 teaspoons olive oil; season with 1/4 teaspoon salt and 1/4 teaspoon pepper. Grill mushrooms, gill-side up, basting frequently with vegetable broth, about 4 minutes per side. 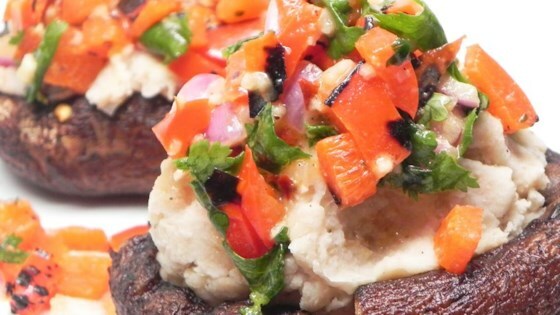 Top each mushroom cap with 1/2 cup bean puree and 2 tablespoons of harissa sauce. Harissa sauce can be made the night before.